After living in Estonia, US, Germany and Australia, I have now lived in London for the past 6 years. 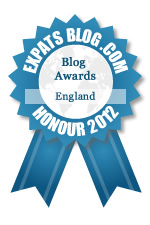 Keep reading it:) True Expat's blog, love that you write about your experiences in different countries and how does it compare to your original and current homeland. love the layout and the honesty. i connect with your values and your views. great layout, easy to search. I have been following Mrs B's adventures for a couple of years and I almost feel part of her family. I have been following Mrs. B for years through the evolution of her blog and her life. Her posts are thoughtful and thought-provoking; her photos are beautiful!